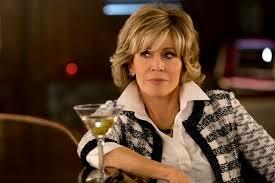 Jane Fonda Interview: Grace and Frankie “I believe in hard work…I’m my father’s daughter”. Jane Fonda is still raising hell at age 79. Currently co-starring opposite Lily Tomlin in the Netflix comedy GRACE AND FRANKIE, now entering its third season, Fonda will also be returning to the big screen in OUR SOULS AT NIGHT, a drama that sees her reteam with Robert Redford who last worked with her on The Electric Horseman (1979). Effervescent, forthright, and fearless as ever, Fonda is enjoying her seventies perhaps more than any other decade of her life. “I’m much happier now…It’s hard to be young. There are so many ‘What ifs. '” She’s also reinvented herself as a TV actress.